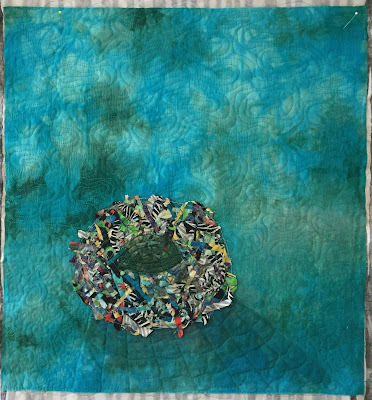 I saved scraps from making children's' charity quilts and bunched them together confetti style to make a nest. Then I scrunched together some green tulle to get the darker center area. I found a perfect background fabric from my stash. 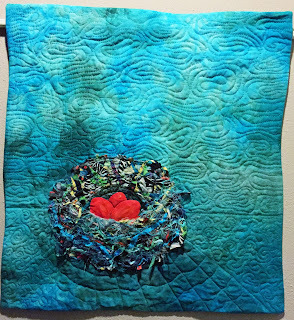 The quilting was done to give some kind of ground effect to the nest. 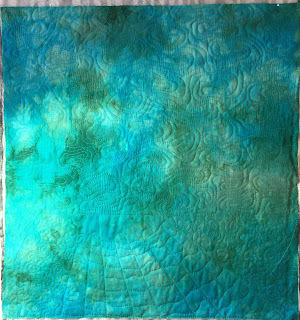 After the quilting was done, I used Inktense pencil and shaded in the area underneath the nest. then I attached the nest. This time after I attached the nest, I went back and did some "long stitches" with invisible thread so that I could weave in more fiber on top of the nest. I did this by taking a few stitches in place, then raised the presser foot and moved the piece an inch or so, then took a few more stitches. I did this over the front part of the nest only. 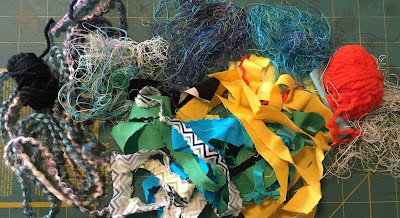 Then I pulled out a bunch of fiber things, including yarn, thread, hand dyed fabric and rick rack from my collection. Did I ever tell you that people bring me all kinds of things to use in my fiber art pieces? I love getting all of this cast off stuff and especially like using it in my nest art quilts. So here's the pile of stuff. After I added the fluffy stuff on the front of the nest, I decided it looked too blah! My husband said it needed eggs. So I tested out several colors of black/white and orange. He liked a marbled orange the best, so that's what I used. I added highlights and shadows with Derwent Inktense pencils. And here it is what it looked like after I added the eggs. I'm sure I have the light source all mixed up, but it's OK. I like it like it is. And here it is after I did the facing. It has been fun to make another nest quilt after all the time has passed, and I hope to make some more. 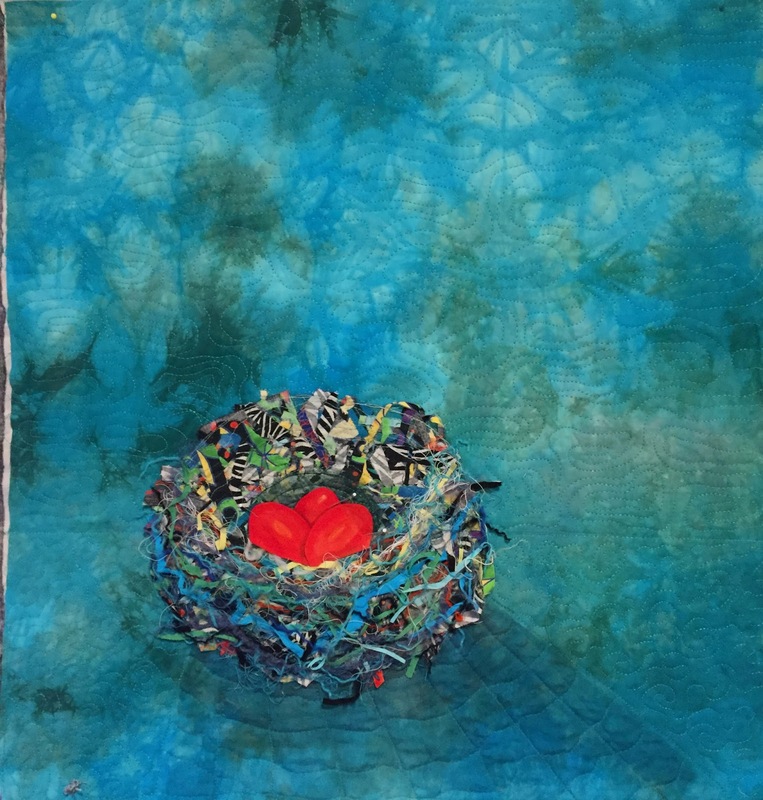 I like the way you wove in more "stuff" and what wonderful "stuff" you had to weave into that nest! I like your "artistic" edges on your project. 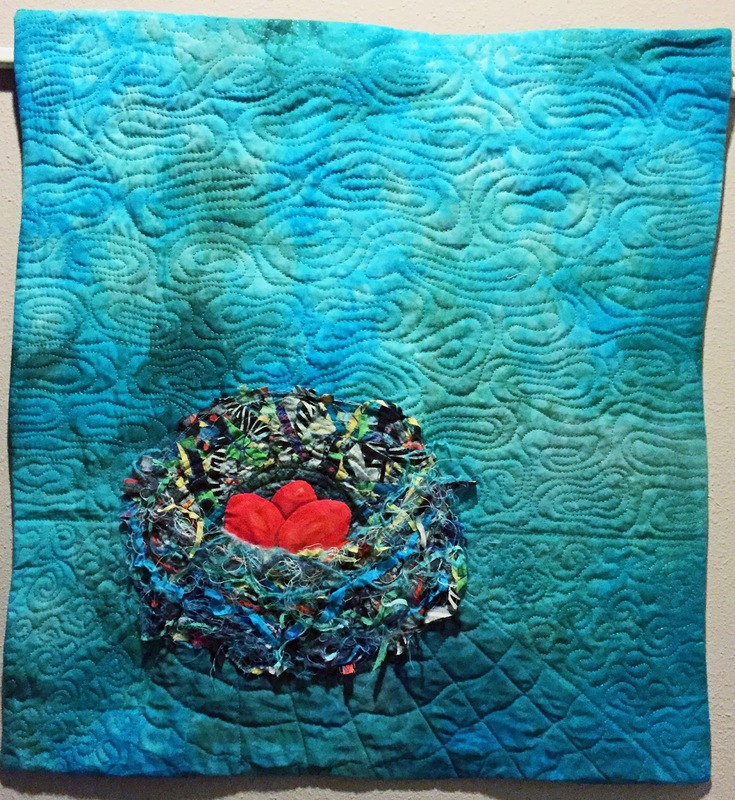 Great nest quilt. . . of course, I LOVED the red eggs!